A composite loop from the National Weather Service phased array radar in Norman, OK, on May 31. Note the large hooking feature that occurs near the upper left blue line (US I-40) west of the city; this is an indication of the precipitation of the storm being wrapped around the tornadic circulation, which persisted for 40 minutes. During this period rotational velocity for the storm was one of the highest ever observed, with a mobile radar recording wind speeds of 296 mph above the ground, well in excess of the EF-5 tornado wind threshold of 200 mph. Source: NWS Norman Oklahoma (http://www.srh.noaa.gov/oun/?n=events-20130531). 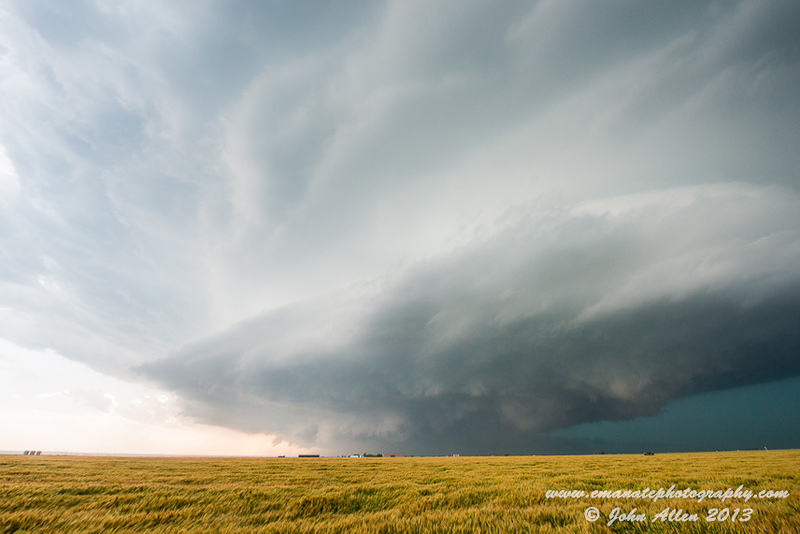 I’ve been chasing storms in the Great Plains of the United States since 2010, and before that in Australia since 2003. My interest in meteorology started from an encounter with a hailstorm in Sydney, Australia back in 1990, and since then I have had an avid interest in storms that has led me to my career path in meteorology research, particularly the environments associated with severe thunderstorms and tornadoes. 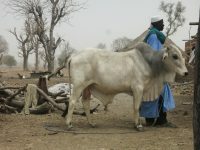 This research has brought me to the Earth Institute’s International Research Institute for Climate and Society, where I work as a postdoctoral scientist. I have been looking at the relationships between climate change and the frequency of tornadoes, hail and other events, and possible avenues for future prediction – not a simple problem by any means. In late May, with a potent system moving through the plains, my girlfriend Rose and I took the long drive out toward Oklahoma. Things got off to a slow start for the trip, with a few disappointing days through Kansas and Texas. 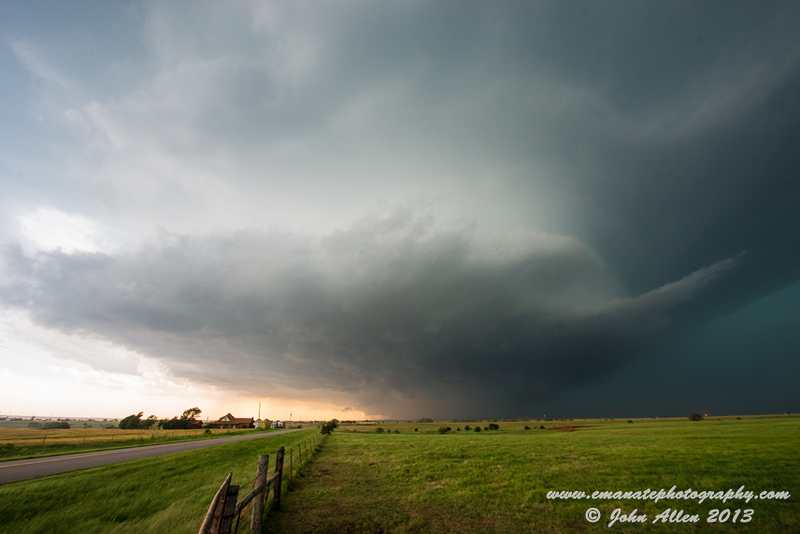 But impressive storms on May 30 in Oklahoma rekindled hope that the last day of the trip might yield something impressive. The Storm Prediction Center, which issues risk assessments of severe weather, forecast a Moderate risk (see risk map)—a 45 percent chance of severe thunderstorms (hail bigger than an inch, wind greater than 50 mph or tornadoes) within the risk area, with a 15 percent chance of tornadoes. Most days you chase in the plains might have a 2 or 5 percent chance and do produce tornadoes, so 15 percent is fairly good odds that one will be found in the risk area—there was even a suggestion that strong or violent tornadoes were likely (EF2-EF5: tornadoes are ranked against the Enhanced Fujita scale, a measure of wind-speed estimate based on damage to structures; an EF0 might blow your garbage bins around, an EF2 can remove your home’s roof, and an EF5 can leave nothing standing and throw objects including cars considerable distances). Risk Map: The Storm Prediction Center tornado outlook may for May 31, showing the percentage chance of a tornado being within 25 miles of a location within the outlook area. The red area denotes the highest probability of 15 percent, while black stippling indicates the chance of strong tornadoes. For further information on hazardous outlooks, see: http://www.spc.noaa.gov/misc/SPC_probotlk_info.html Source: NOAA Storm Prediction Center. Only a week earlier similar potential had yielded several violent tornadoes, including one that destroyed parts of the Oklahoma City suburb of Moore. Driving through damage like that as we did the night before quickly sobers any hope that strong tornadoes may occur: You could see a path where nothing of peoples’ lives remained. Tornadoes are rare at any one location, but out of anywhere in the United States, the central Oklahoma area has the greatest risk—and this day would prove no exception. We began the day in southern Oklahoma City—in a hotel that I would rather forget. The morning was cast in a dull light by stratocumulus spreading to the horizon—a sign that there was plenty of moisture in the air. As the sun began to get higher, the cloud began to break up due to heating, with temperatures beginning to warm into the mid-80s Fahrenheit. I’ve started many days like this in Oklahoma, and in most cases a type of severe thunderstorms known as supercells form. These rotating and long-lived storms are the most common producer of tornadoes and hail in excess of 2 inches. Every morning when chasing I spend time considering the computer model forecasts, synoptic charts, satellite images and surface observations. What seemed a quicker look than usual suggested that a potent dryline (a dry surge of air from the western deserts) would move east and meet a weak front in central Oklahoma, causing storms to form. Surface humidity was forecast to be very high, and heating at the surface suggested the atmosphere would become very unstable by late afternoon. A common measure of this instability, known as CAPE (Convective Available Potential Energy), was forecast to be above 5000 Jkg-1. This is amongst some of the highest values for this parameter I have ever witnessed in person. Under these conditions, storms can reach heights of 60,000 feet and produce hail in excess of 4 inches. Another quantity I look for is wind shear. It’s a measure of the way that the speed and direction of the winds change with height. Have you ever looked up at the sky and seen one cloud moving in a particular direction, and a cloud that was above it moving in a different direction? That’s wind shear. It’s important because it allows storms to get rid of the rain that is in their updrafts downwind, meaning that the updrafts last for longer. If it also involves changing direction, particularly in the lowest three kilometers, then thunderstorms can begin to rotate—essential for tornadoes. This rotation is strengthened by the stretching of the strong updrafts—like when you spin your office chair and switch between extending your arms and crossing them over your chest; when you do the latter, your rate of rotation is faster. The wind shear for this event was well above average for the area: Storms would be rotating strongly. 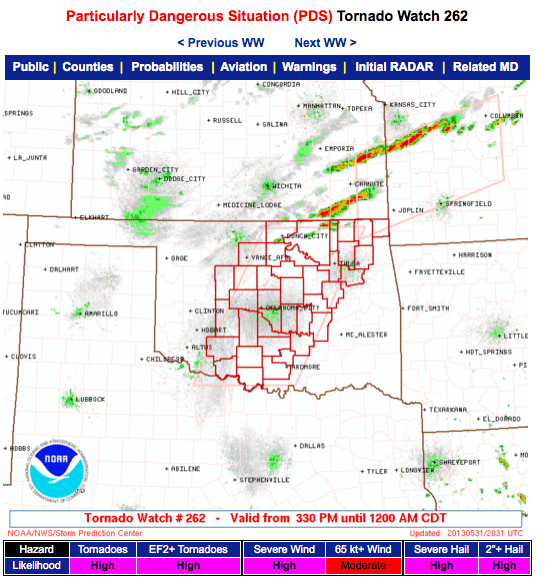 Particularly Dangerous Situation tornado watch issued at 3:30pm CST May 31 for Oklahoma. Source: NWS Storm Prediction Center. Putting my forecast together told me that the potential for strong supercell storms, with a high potential for tornadoes, would exist west of the Oklahoma City metro area by late afternoon between El Reno and Chickasha. Based on this information, we moved to El Reno Lake, to await the storms. 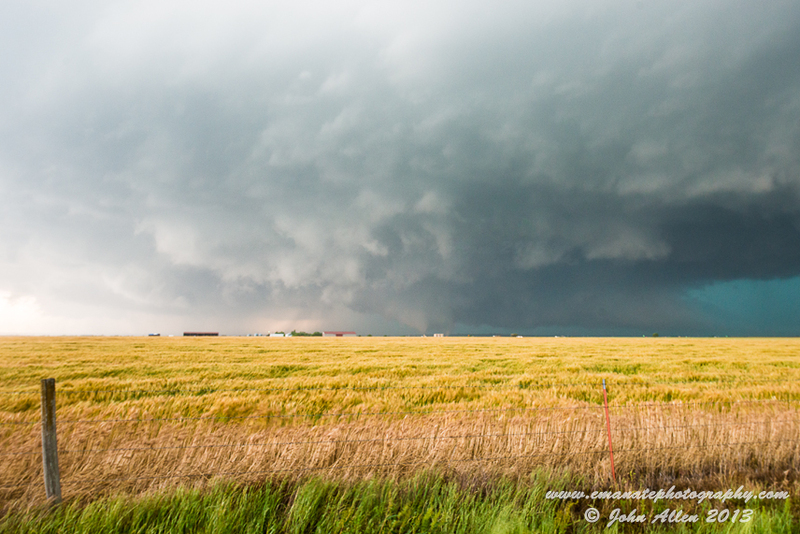 We were far from the only chasers out, with people from across the United States and quite a few from overseas. The heat of the day took the temperature to 90F, with relative humidity of 65 percent—incredibly uncomfortable without air-conditioning. 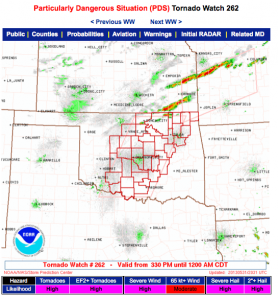 With thunderstorms likely to form, the Storm Prediction Center issued a Particularly Dangerous situation tornado watch—reflecting high likelihood (>90 percent) of more than two tornadoes for central Oklahoma, and a 70 percent probability of one or more strong to violent tornadoes (EF2-5). This tends to simultaneously get the blood racing with anticipation, and create a stomach-churning dread that you know people will likely die given the proximity to urban areas, with nothing that you can really do to prevent it. Storms began to form to our west at 4 p.m., and we moved into position on a storm west-southwest of El Reno that was beginning to mature (see map 1 below). Approaching storms can be a hazardous business, with lightning and hail the early threats, so we moved in safely from the east. By now incredible lightning bolts were coming from the cell’s anvil. At 5:30 (map 1) we positioned just north of an east road to watch the cell mature and try to photograph one of these strikes. The cell began to get serious, drawing in the warm moist air, and I decided to move us back further east to avoid any issues. The next view we got in a driveway began to show the storm’s structure properly as the inflow (winds rushing toward the storm) howled at over 50 miles per hour—I could barely stand, and holding the camera steady was incredibly difficult. 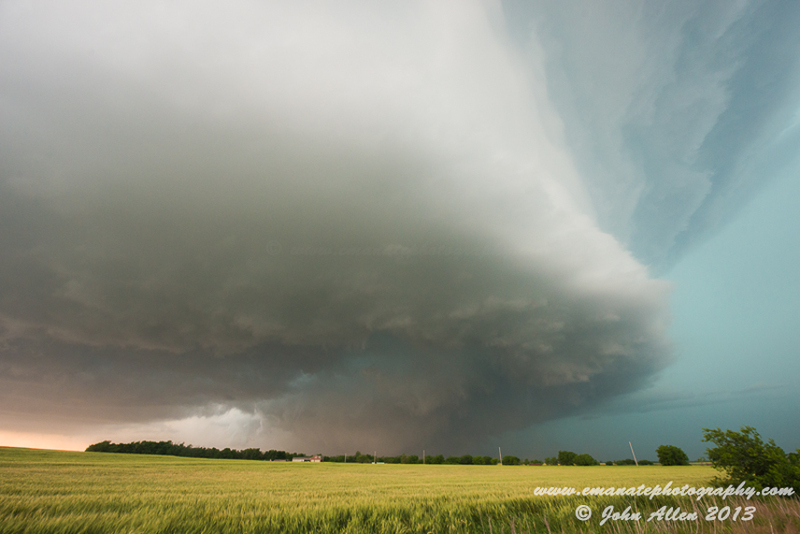 The structure of the storm at this stage was also a sight to behold, as it began to really wind up. In these conditions this transition toward the production of a tornado occurred in less than an hour. 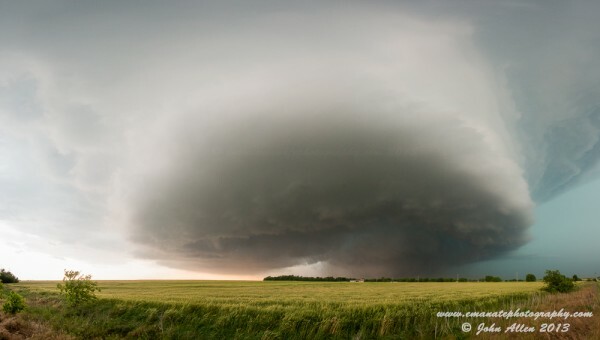 Rapid Development: The supercell takes a classical, though slightly high precipitation morphology, with an impressive barreled structure and inflow that made it hard to stand. 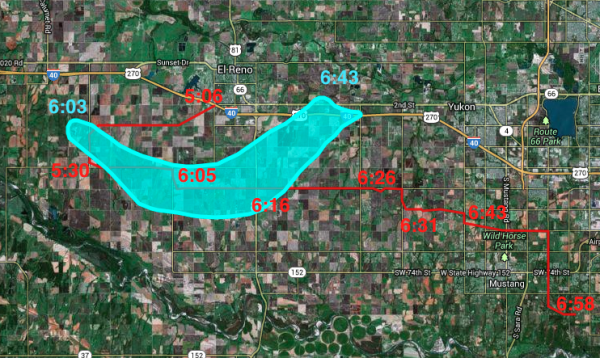 By 6:03 we were in position on a north-south road (see map 1) as the tornado developed from the surreally structured mesocyclone (the rotating updraft of the supercell thunderstorm). This organization amongst the chaos of an unstable atmosphere is one of the things that brings me chasing. Oklahoma Scissor-tail: Like the state bird of Oklahoma (the scissor-tailed flycatcher), scissor-tailed inflow stretches into the strengthening mesocyclone as a tornado begins to develop. 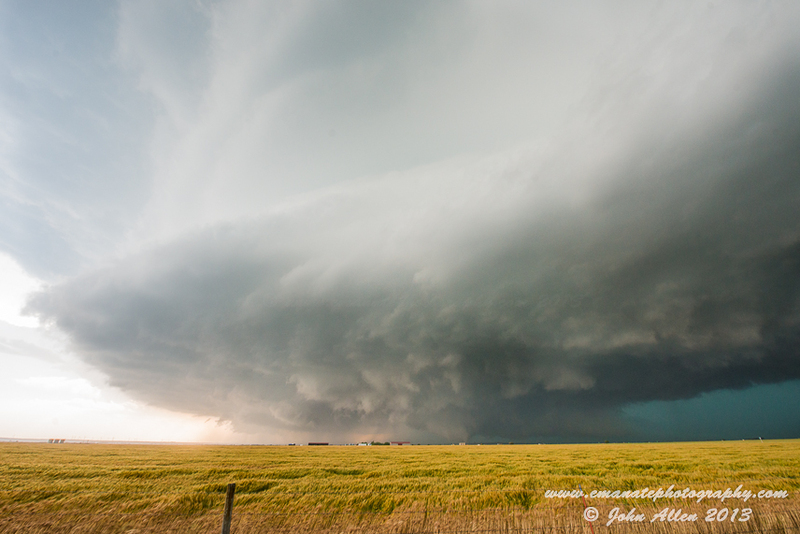 Sculpted Above and Below: The tornado begins to develop under the base, with an inflow tail visible under the incredibly sculpted barrel mesocyclone. 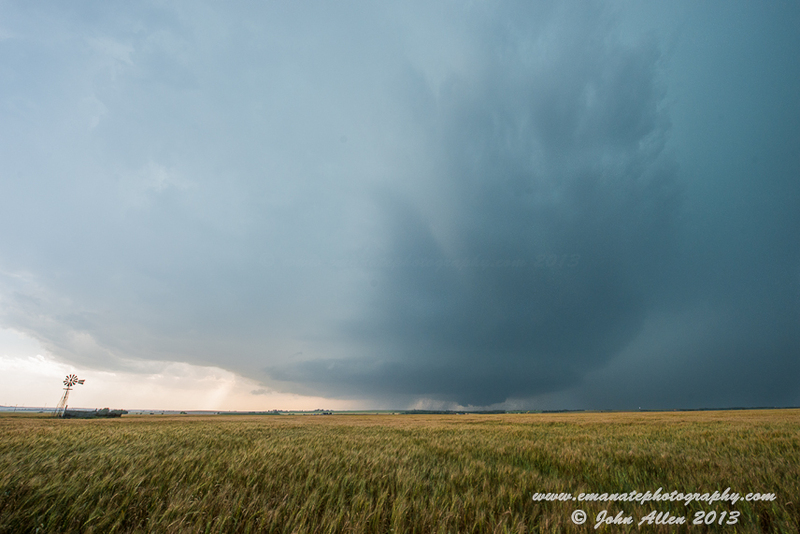 Southwest of El Reno, OK. This was my girlfriend Rose’s first tornado, which made things exciting despite concerns about our proximity to the city. The tornado took on a multivortex character, where multiple areas of near surface vorticity (spinnyness) are stretching by the strong convergence and updraft of the mesocyclone, and moisture condenses within the low pressure of the vortex. These vortices danced around a central point of convergence and caused the appearance of the tornado to vary greatly. The wind again began to howl over us, and seeing that the tornado was approaching quickly, I elected to race us east to avoid the hordes of people chasing the storm. When we crossed US-Route 81 at 6:16, images I have seen show the tornado perhaps a mile to our west, more than close enough for me. 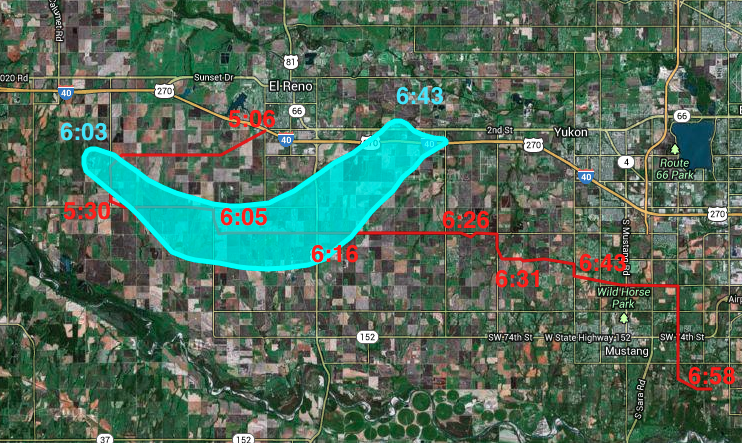 We moved further east, and pulled up at the point labeled 6:26, when the structure of the storm was exposed beautifully with the now giant wedge tornado (2.6 miles diameter of radar-derived EF-1 winds) buried underneath to our northwest. 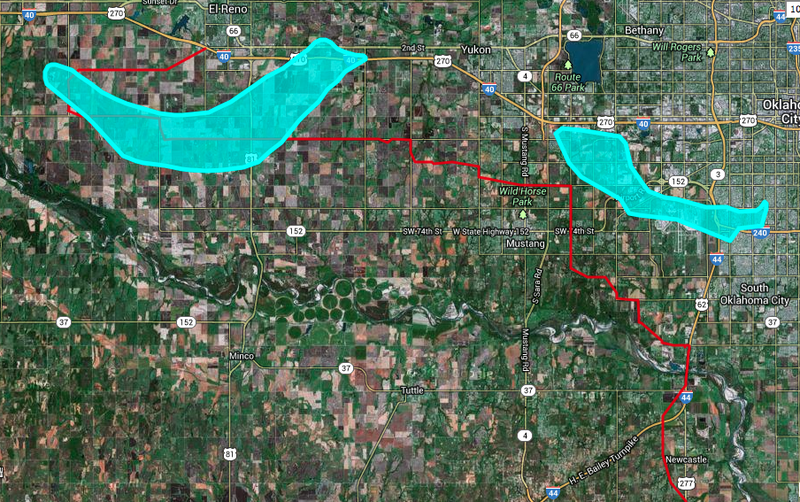 This was an incredible and yet frightening sight, given that the GPS reporting of a number of chasers placed them within the actual tornadic winds. Fields of Gold: The clouds contort as the supercell focuses its energy to the central circulation, as vortices begin to periodically extend from the ground to cloud. Multivortex Majesty: The tornado touches down with multiple vortex tendrils extending from the supercell’s base and a strong inflow tail. Layered Twins: The spectrum of color stretches from bottom to top with twin vortices, from the verdant fields and into the clouds. Below the Mesocyclone: The stovepipe tornado stretches down below the structure of the supercell mesocyclone and tornado cyclone. This would go on to become the EF-5, 2.6-mile-wide monster. The Beast Retreats: The tornado darkens and grows in size, though little would suggest that soon this monster would stretch to over two miles. 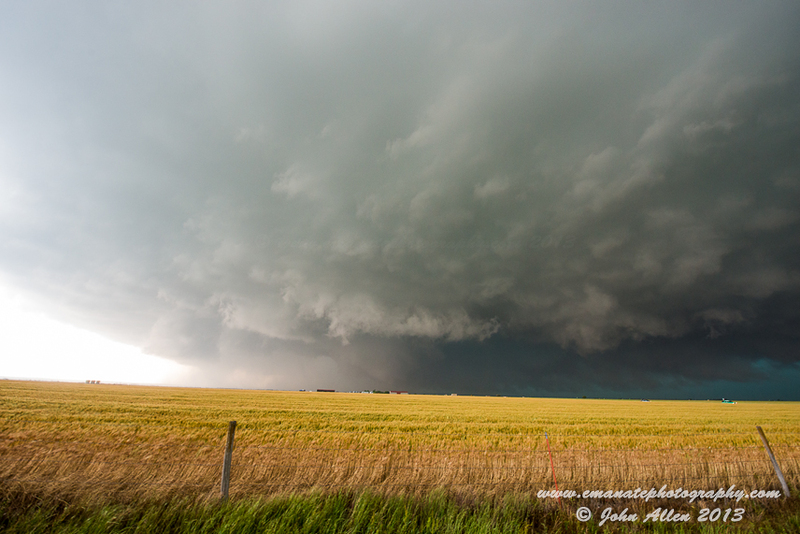 Under the Meso: As the mesocyclone approaches, the dark tornado and rapid rotation stretch to our west. The time to run from the storm is at hand. The El Reno Wedge: A large EF-5 wedge tornado under an enormous HP/Classic supercell observed from southeast of El Reno/Union City. 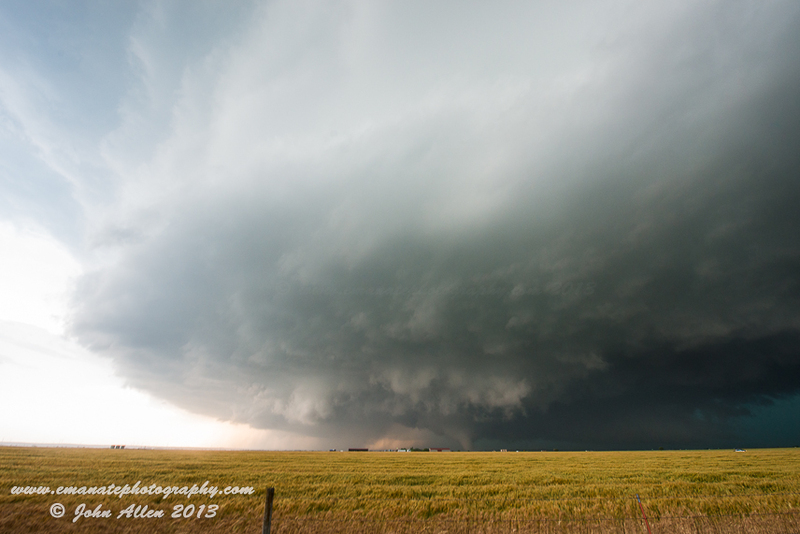 Beneath the Beast: A large EF-5 wedge tornado near El Reno, OK. The tornado had the distinction of being the widest recorded, with EF1 winds to a diameter of 2.6 miles. Sadly, the storm took four storm chasers’ lives. Given that a new area of rotation appeared to be forming on radar to our northwest, and was moving southeast toward us, my concern was that we could be in the path of a second tornado. This concern was deepened by hearing tornado warnings issued for our position, but poor visibility and the more urbanized environment meant that the situation was becoming unsafe, so we decided to get out of the line of fire. To do so, we continued to drop south and east to avoid the old RFD surge (rear flank downdraft – a gust surge of the winds that wraps around the tornado carrying wind speeds in this case of 100mph and hail in excess of softball size) and the new mesocyclone as the storm began to regenerate. However, as we approached the outskirts of the metro area, we were slowed by traffic, leading to a relatively close call (see map 2) to the south/southwest of the second tornado that went on to impact the airport and southern Oklahoma City. We made our escape without a scratch and stayed the night in Chickasha, OK.
A Glimpse Below: The dark wedge tornado is spread beneath the enormous mesocyclone, at this stage, likely at its widest. It is difficult still to really comprehend the size or intensity of this storm. Shot taken SE of El Reno. Golden Wrapping: Over gold wheat, the mesocyclone and the large tornado begin to rapidly wrap in rain, shifting northeastward before occluding. In the aftermath of this event, several things came to light that are disturbing from a standpoint of storm chasing, emergency management and the involvement of the media. Storm chasing has been actively pursued for the past 40-50 years, and was indulged even as early as the 1700s on horseback by Benjamin Franklin. And yet, in that period, there have been no deaths, despite the exposure to the elevated risk of severe thunderstorms, tornadoes and lightning strikes. There has been a degree of luck that no one had died up until May 31, 2013. There have been close calls, but no one has even been seriously hurt. This is perhaps a testament to the scientific origins of the pursuit, which focused on safe documentation of the event rather than thrill-seeking. Both Hollywood (“Twister,” 1996) and reality television (“Storm Chasers”—Discovery Channel), together with spreading social media, has fueled rampant growth in the number of people who chase storms. Unfortunately, many of these people are thrill-seekers driven to grab some extreme close-up tornado video footage; many try to market this footage to the media. Some of this group poorly reflects on those who chase more responsibly, and for science. For example, an electrical engineer named Tim Samaras chased with others attempting to deploy a type of probe (not dissimilar to the idea in “Twister”) in the path of the tornado to measure what a tornado actually looks like and its internal conditions. Tim was the first to succeed in this endeavor in a significant tornado (Manchester, S.D., in 2003; see here), recording a 100 mb pressure drop and gaining valuable insight to what it is like in a tornado. Despite having to cut it close, Tim always did his best to ensure the safety of those he chased with. The tornado on Friday, May 31, will be remembered as a day of great sorrow in the chasing world. Four storm chasers were killed by the tornado. Three of these chasers were Tim Samaras and his team of scientific researchers, who likely died when deploying probes in the tornado’s path and unexpectedly had a strong vortex pass over them moving at something like 150 mph, with wind speeds that simply picked up their vehicle and threw it over a quarter of a mile. It is a shock that they were the first people to die, and it required an unusual set of circumstances to do so, as they were well aware of the situation and risks. However, the fourth person was new to chasing, probably seeing his first tornado, and snapped an iPhone photo only 10 minutes before he died. A number of chasers very nearly lost their lives on Friday, as the storm’s mesocyclone actually descended to the ground in the process of producing the extremely wide tornado (from 1 mile wide to 2.6 miles wide in 30 seconds). This suggests that people have perhaps lost perspective of what a storm’s environment can really mean. As the impacts of this storm revealed, even experienced chasers can be caught unaware by a sudden change in storm behavior, and people who do not understand the risks putting themselves in danger is very concerning. It is important to think about and understand what the storm might do in a worst-case scenario and decide if you feel safe to be in that position. Forward thinking is essential to chasing storms—I always plan my escape and re-plan it as the situation evolves; then, when the unexpected occurs, at least you have a way out to somewhere safe. The media involvement in the warning process also played a significant role in what could have been a worse disaster (the major tornado did not impact many significant structures, but 20 lives were still lost due to these storms, nine from the tornado directly, with 71 injured.) A broadcaster from the local television station suggested that people should flee the path of the tornado, even if they could get below ground. This is totally untrue, as the safest place in even the strongest tornadoes is within a structure or shelter and placing as many walls between you and the storm as possible (see an interview with Harold Brooks from the National Severe Storms Laboratory here). The response to this suggestion was likely precipitated by the devastation to the suburb of Moore on May 20, where an EF-5 tornado leveled parts of the city, killed 24 and injured hundreds more. This likely left people in a state of terror that they, too, might be affected by a similar tornado. Had the large tornado of May 31 continued on its path, or the second been larger or stronger, I think it would be right to assume that the death toll would have exceeded the worst tornado disasters in history due to the number of people exposed on the grid-locked roads. The sensationalist tendency of the media to over-emphasize the threat, even after the original tornado had lifted, is something that really needs to be looked at. One could only imagine the repercussions if drivers fleeing on media advice were caught by a tornado. Additionally, the evacuation management procedure needs to be looked at, as some of the highways had people driving on both sides of the road, while well-meaning law enforcement closed roads in some cases in ways that increased the risk. And, finding ways to communicate the all-clear after such a panic should be a high priority for warning agencies. In future I think I will be steering well clear of the Oklahoma City metro area for significant tornado threats, and city areas in general. So where does this leave me on whether I continue to chase storms? I don’t think it will stop me chasing storms; but I will certainly think twice about what the environment means on a particular day before chasing. What will happen to these environments as our climate changes and warms? 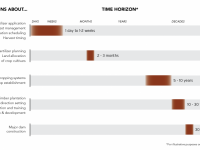 That remains uncertain due to the relatively small time and space that tornadoes occupy, though early indications have suggested an unchanged or decreasing frequency of days that produce tornadoes. For further technical details concerning the storm environment and the events that potentially led to the death of storm chasers, see John Allen’s blog post and remembrance of the TWISTEX team. It doesn’t look like TWISTEX was deploying at the time. I heard from a chaser who was the car immediately ahead of TWISTEX and ~4 car lengths ahead of them at the intersection a mile west of where TWISTEX was hit. He had a rather harrowing story to tell and, later, realized that, when he got east of Reuter Road, TWISTEX wasn’t behind him anymore. Also, I’m not SPC. I’m NSSL. What a deadly thing to do.. “Chasing tornadoes” seems so exciting yet seems so scary, can’t imagine myself if i had to be the one that chase that scary thing.